The truth is our Indigenous ancestors were never “savages” or “illiterate” in the first place. They were a people who lived in complex societies and achieved amazing feats in their time. The capital of the Aztec Empire had the largest population in the world in 1491. The Tawantinsuyu Empire was the largest empire in the world in 1525. The Mayas invented an accurate calendar based on astronomical observations made in 1491 – an accomplishment that no other civilization during that time achieved. How is that “savage’? We mixed-Indigenous people happen to speak Latin languages because of colonialism. But that does not make us fully Spanish. Or less Indian. The “Indians” in North America and “Indios” in Central and South America are victims of colonization. But we Indo-mestizo people are also victims of colonization whether we want to see it or not. I notice we divide our own communities based on skin color and background. We make prejudices about Blacks, Natives, Whites, and Cholos. 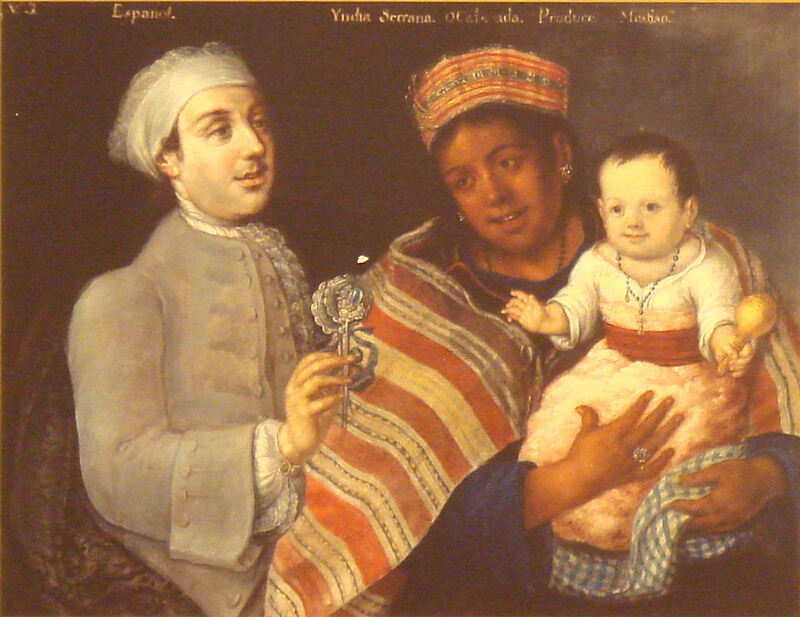 We look at a newborn and praise their blue eyes and light skin como la bisabuela de Espana, but not their black hair and morena piel como la bisabuela Indigena. Sometimes if a Indo-mestizo does something silly, society tells them “No seas Indio (Don’t be Indian),” culturally translating to, “Don’t be stupid.” From a young age, we are taught that Columbus discovered our ancestors and The Catholic Church saved them from savagery, which is damaging to the youth psyche and understanding of Indigenous culture. However, this does not mean Indo-mestizos should culturally appropriate other Indigenous cultures as part of their identity. This does not mean we were plumes and pretend we speak a native language. This does not mean we quickly identify as Indigenous and wear regalia and claim it as our own. Because none of this is right. But I do want to point out that some of us Indo-mestizo feel the strong urge to reconnect with our ancestral roots, culture, language, music, and dance. We see the beauty in Indigenous identity because we feel it in our blood and we re-tell our oral tradition to our close relatives and friends as well. We spend time researching our family tree and try to find the right connection to learn of a culture that should belong to us, but does not exist anymore. Because one day, we hope our mixed-Indigenous heritage, culture, and narrative becomes a part of society, school curricula, and media, too. Because when we try talk to others about our mixed-Indigenous identity, we are faced with people who do not approve of such curiosity or ridicule our attempt of re-indigenizing. We retrieve back to the closet and pretend the backlash never happened. We conform to the Casta system, to the Latino label, and to just be Hispanic. If we continue to turn a blind eye at our other half-Indigenous heritage, we will never unite as one pueblo, one country of Indigenous and Indo-mestizos and other mixed-races to protect our land, our food, and our way of life. We have to look into the past in order to understand who we are in the present and where we are going in the future. This entry was posted in October 2013 and tagged American Indians, Border Patrol, Colonization, Discrimination, Divide, Division, Ecuador, Ecuadorians, English, Hispanic, Illegal Mexicans, indigenous, Indigenous peoples of the Americas, LastRealIndians, Latino, Mexico, Pan-American Indian, Peruvians, Race and ethnicity in the United States Census, Racism, Salvadorans, South America, Spanish, Spanish language, United States, Unity. Bookmark the permalink. “We think that one social class is better than the rest. We make prejudices about Blacks, Natives, and Cholos.” I would also add White into this listing about prejudices because more and more if you look White or too White then you get all the race hate mess. We as Indigenous people are all being attacked from all sides both within and outside our communities. Other than this small point the article was right on. Thanks so much Scott! This will be added on the article with your comment. Not only mixed people who look white, as Scott said, but unmixed white people also face more discrimination these days. Why do people need to discriminate anyone? Why cannot we look at each other without dividing into groups? Racism is racism and displays the same same ugly character no mater which way it points. If “Race” matters to you at all then you are inherently Raciest and no better than those you accuse! There is but one race! The Human Race! Then and only then can you grasp the concept of the vile things that have been forced upon the Native Tribes of America and Canada and all under the guise of RELIGION; but if you really cared then you would have known and this information would not come as a surprise or a shock to you – your noble HUMAN! As a descendant of a Native American (Tohono O’odham/Yoeme) mother and a Mexican father (Jalisco, Mex. ), I’ve have had to deal with most of the issues in this paper. I have my C.I.B. and enrollment papers (political and legal). I went to middle and high schools on and off the rez in the late 70s to early 1980s. In the urban cities we lived among the Mexican immigrant and Chicano-Mexican American neighborhoods-populations. Personally I have encountered racism by both Chicano-Mexican and Native populations, however primarily from the Chicano and Mexican. Most of my anger and resentment regarding these experiences I have dealt with, long ago. The “Tohono O’odham and Yoeme” are unique in that they are both border tribes with tribal members on both sides of the international boundary, (my maternal Tohono O’odham and Yoeme grandparents, immigrated to the U.S. and Arizona in the early 1900s, from the state of Sonora, Mexico). Via Chicano-Aztlan and Mexican-Latin American studies, I have read claims by scholars within these disciplines that our lands, meaning Tohono O’odham and Yoeme belonged and continue to belong to Chicanos, Mexican nationals and the United States of Mexico, which is and was farthest from the truth. It was ours to begin with and we still live in and on our Native lands, urban and reservation and yet we still face disregard for our presence today, among those who would like to dispossess of our lands, via the idea-notions of Aztlan and the Gran Chichimeca. The romanticized notion of the Gran Chichimeca also disregards our past and present existence and attempts to rewrite history and Native populations, out of the history books. Today, having studied Pan-Indianim, I have since come to the conclusion that Aztlan-Chicano Studies-ideas-beliefs are practicing a form or kind of Pan-Indianism, which I have entitled Pan-Mestizo Chicano culture. And like Pan-Indianism, which is a mixture of different tribal practices and traditions, that came about because of U.S. Policies, most specifically via the U.S. 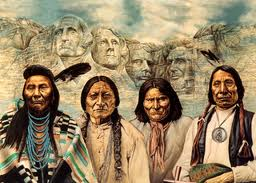 Termination and Relocation periods of the American Indian political history, Pan-Mestizo and Chicano cultures are merely trying to locate its presence and place among the enormous melting pots of, Native, mixed blooded and white skinned populations, found through and among the southern Americas, including parts of the U.S.A. The truth is that the country of Mexico was inhabited by many different Indian Nations and not just Mexica-Aztec peoples. Along the bordering states there are Raramuri Indians (Chihuahua), Kickapoo (Coahuila), Tohono O’odham (Sonora and Arizona), the K’uapa along and in the Colorado river delta are, and finally, Kumeyaay (Baja and Alta California. However we are not nor have we ever been Mexica-Aztec peoples, but Tohono O’odham and Yoeme Nations, nor are we part of the Gran Chichimeca that Chicano and Mexican studies propose. This entire topic is extremely complex and dynamic. I have only covered what I have come to suppose and subsequently believe. I have been at UCAL-berkeley, where one year, the Chicano students wishing to join a Native student-sponsored powwow and were denied entrance, (I never spoke with the Native Students from UCAL, as to why they chose to deny the Chicano Students request). Conversely, I have heard other positive stories by other Native peoples of their belief of Mexican and south American nationals as Indigenous and their place with the grander cultural structure within what is considered Native American and rightfully Indigenous. My hope is that one day, Chicano and Mexican-Latin American studies will present history as it actually happened, and still practice their kind of Pan-Indianism, again, I refer to as, “Pan-Mestizo Chicano culture.” Please excuse any grammatical errors, including my brief attention to detail, and the widening of the topic to include Chicano-Aztlan, and Mexican-Latin American studies. This topic is a double edged sword. Thank you for your consideration and time. I think the pendulum will end up swinging back in the human consciousness to a place where it is of the majority opinion that the superior, sustainable way of operating a society is that of indigenous culture models… We are simply trapped in a time of history that mistakenly values commercial, material, and monetary excesses over health and sustainability. A day will come when the status quo shifts, and pride will then be heartfelt and nurtured in the hearts of indigenous youths from the time they were born. I seriously believe that. All of these observations of “mixed” indigenous people are applicable to the Métis of the Great Lakes and the Creoles of Louisiana. The only difference between us (Métis and Creole people, of which I am) and “Latinos” is that you guys were colonized by the Spanish and we were colonized by the French…all of those communities are facing similar issues, though. Most Mexican people are of Indian blood, the brown skinned dark tan with facial indigenous resemblance to that of pre-Hispanic conquests. Just go to Mexico and you will understand. The difference is that in Mexico, the Indians were more free than in the US. Everyone in Mexico is proud of their Indigenous background, as in the upper class, they are the more European but make up less than 10% or so. Mexican peopleare overwhelmingly indeginous.